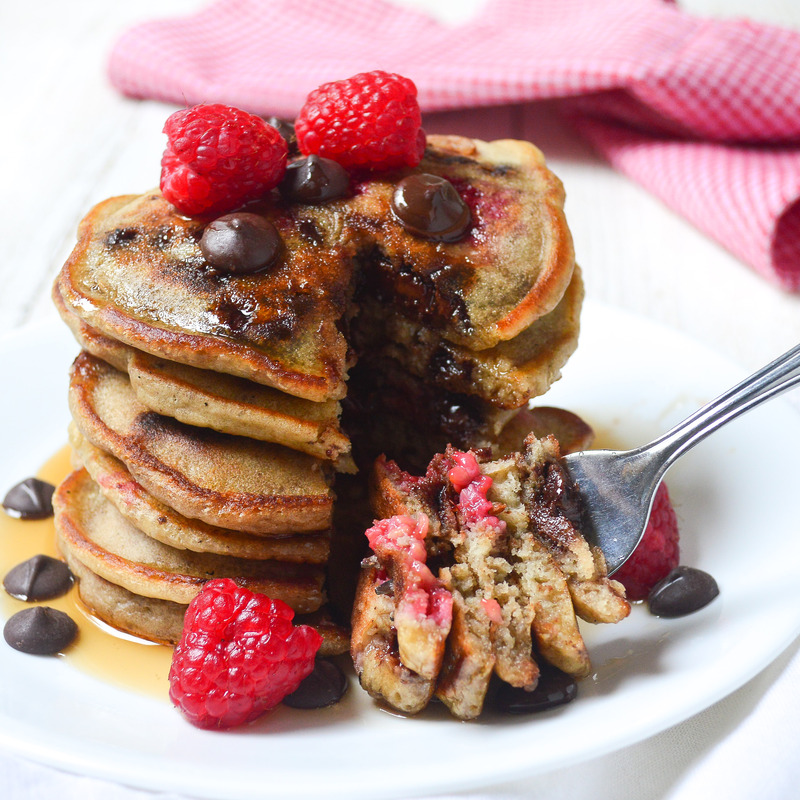 I made these raspberry chocolate chip pancakes to cure my Monday-itis and it worked! 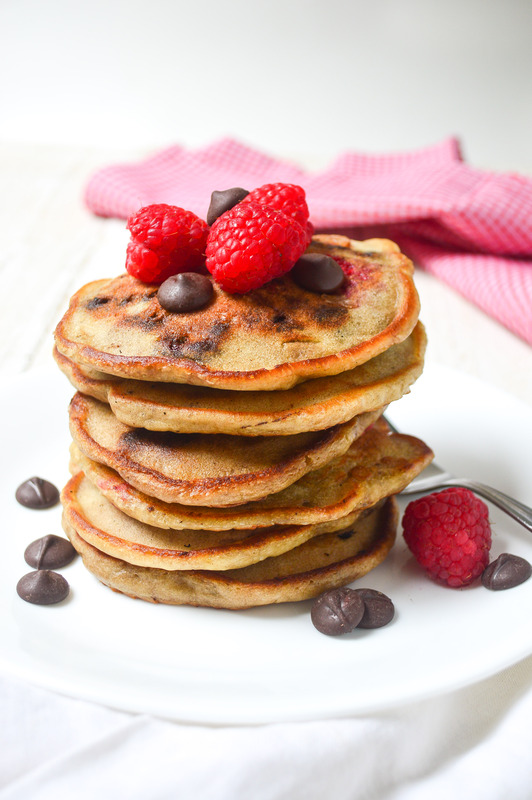 This recipe yields a whole lot of pancakes- I was able to get 14 from the batter bowl, which means I get to enjoy these all week long. And every once in a while it’s nice to have a decadent dessert, uh… breakfast waiting for you in the morning. Now, let’s talk about the combination of fruit and chocolate for a second. Why is it that those two pair together so well? There’s something about tart, fresh raspberries (especially now that berry season is coming back!) paired with semisweet chocolate that I find irresistible. The first time I made these pancakes, I was thinking that THIS is what you make the morning after a kids slumber party. I would have gone nuts for these. But after taste testing, I don’t think adults could resist this combination either. 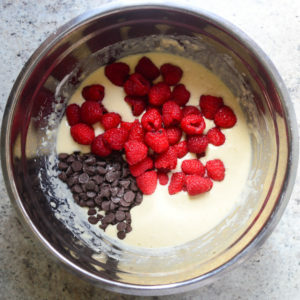 Just make sure you get enough of both the raspberries and chocolate chips in every scoop of batter. 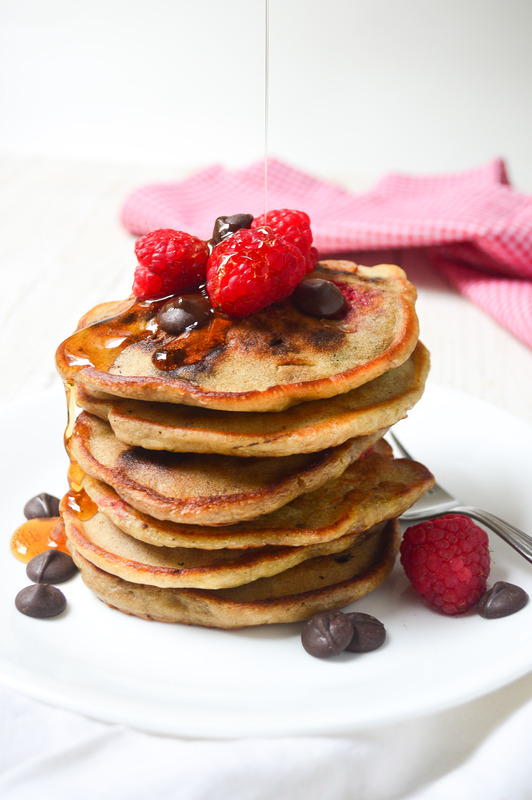 Serve stacked with some warm maple syrup. Whisk the flour, baking powder and salt together in a large mixing bowl. Set aside. 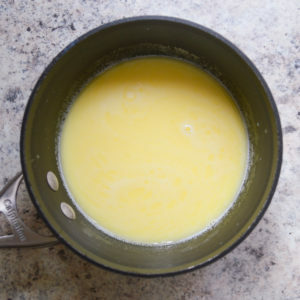 Heat 4 tablespoons of butter together with the milk in a small saucepan and stir until the butter is just melted. Let it cool slightly before whisking in some eggs. Make sure your butter isn’t so hot that it will start to cook your eggs. Stir the egg mixture into the dry ingredients and mix until just combined. 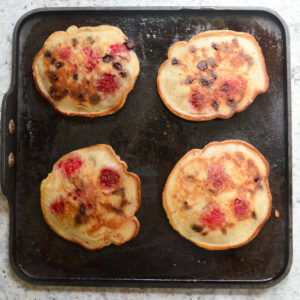 Gently fold in the raspberries and chocolate chips. Coat a griddle or 12 inch skillet with a little butter over medium heat. You want the surface to be hot enough to make drops of water scatter over the surface. Drop 1/3 cup of batter per pancake and cook until bubbles appear on the surface and the undersides are golden, about 1-2 minutes. Flip and heat another 1-2 minutes, until pancakes are cooked through. Repeat with remaining batter and keep the pancakes stacked and covered to keep warm. Raspberry Chocolate Chip Pancakes- a decadent breakfast treat made with fresh, tart raspberries and semisweet chocolate chips. 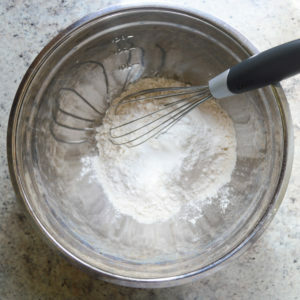 Whisk flour, baking powder, and salt together in a large mixing bowl. Set aside. Heat 4 tablespoons of butter together with milk in a small saucepan over moderately low heat and stir until butter is just melted. Let cool slightly. 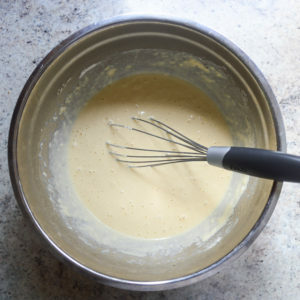 Once cooled, transfer butter mixture to a bowl, add eggs, and whisk together. Stir egg mixture into the dry ingredients and mix until just combined. 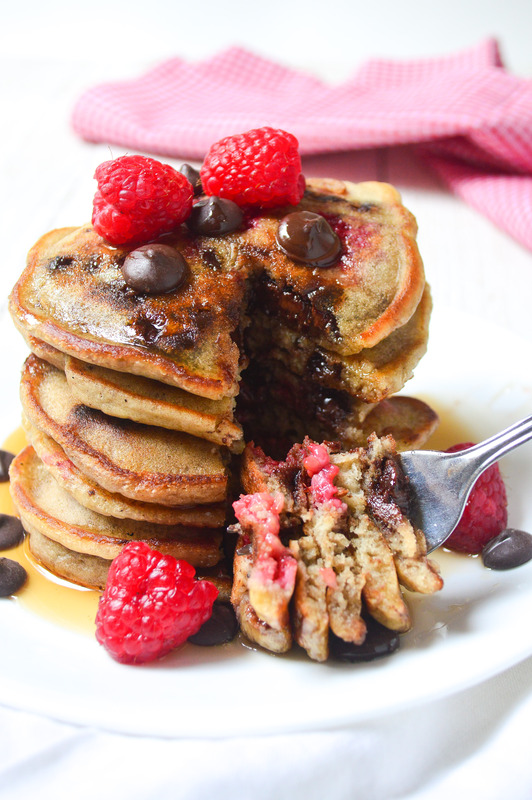 Gently fold in the raspberries and chocolate chips. Heat a griddle or 12 inch heavy skillet over medium heat. Add 2 teaspoons of butter and spread to coat griddle. 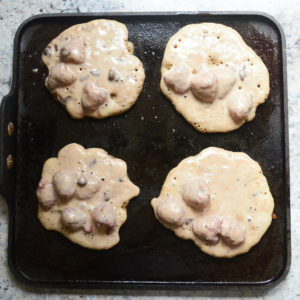 Drop 1/3 cup batter per pancake onto griddle and cook until bubbles appear on surface and undersides are golden, about 1-2 minutes. Flip pancakes with a wide spatula and heat until undersides are golden brown and pancakes are cooked through, 1-2 minutes more. Transfer to a platter and cover to keep warm. Repeat with remaining batter, adding 2 teaspoons or butter between batches. Serve with maple syrup. One way to keep the pancakes warm while the remaining are cooking is to transfer them to a heatproof platter in a 200 degree oven.